Well, 0ver the past two weeks, I (Scott) have made the transition to work in Casualty, which is the name of the ER at Tenwek. Needless to say, this has been quite the interesting, challenging, and unique experience. In addition to working in Casualty, I continue to round in the ICU and on the medicine service in the mornings, then cover casualty in the afternoons/evenings. This double-duty has made the past few weeks especially busy, but Steve, a fellow Duke resident, is also on the medicine service now, so it has been enjoyable working together and brainstorming solutions to a variety of dilemmas. Below are some of my experiences I’ve had while working the last two weeks. My first day in casualty was actually rather calm with no trauma cases and no pediatric patients (two types of patients that Internal Medicine physicians like me do not typically provide care for). However, day two was especially hectic with several minor traumas and an overflowing Casualty unit. One particular patient was especially difficult. He was a 17 year old young man who presented with right leg swelling and difficulty breathing. He had been completely active and healthy 5 days prior, and never had any medical problems. When I saw him, he was clearly in distress. His heart rate was very fast, his blood pressure low, rapid breathing, and his oxygen saturations very low at 54% on room air (normal is >90%). With his leg swelling, I presumed that he had a blood clot in his leg that migrated to his lungs causing a pulmonary embolism (PE), which is a blood clot in the vessels that supply the lungs. I gave him a shot of Lovenox, which is a blood thinner used to treat the clot. Ultrasound was done which confirmed the clot in his leg, but we are unable to do a CT angiogram or VQ scan, which are the tests to confirm PE. Nonetheless, based on his history, it was clear that this was the diagnosis. Unfortunately, over the next few hours in Casualty, his condition deteriorated. He became more hypoxic, restless, and developed more labored breathing. He was still able to saturate ok with an oxygen facemask, but I anticipated we would have to intubate him if he worsened. I grabbed an ultrasound machine, and did a bedside echocardiogram on his heart. What I discovered was a massive clot in his pulmonary artery and that the right side of his heart was in complete failure due to the clot. In the U.S., this would be someone that would be a candidate for thrombolytics, which are potent “clot busters”, however, we do not have that here. A few minutes after the ultrasound, he suddenly coded, stopped breathing, and his heart stopped beating. We immediately started CPR, and shocked his heart several times due to an abnormal rhythm. During the code, his labs came back that he was also in renal failure with a high potassium, which may have contributed to the code. We continued the resuscitation attempt for about 30 minutes giving him continuous CPR, shocks, multiple drugs, and intubation, but we never regained a pulse. I was devastated…probably more than any other death I have had in a long time. I don’t know whether it was that he was so young, or that the cumulative effects of all of the mortalities I have witnessed here, finally taking its toll, but whatever the cause, this death was especially difficult. After talking with the family, I came home, and was fortunate to have Whitney to help process my emotions, as I was struggling. That night was a near sleepless night. I replayed the events of that day over and over again, trying to determine what we could have done to save this boy. Through prayer and reflection, I eventually realized that no matter what we do for patients, whether in Kenya, or even in the resource rich United States, we cannot always save everyone, which is a hard truth, but the reality. Although I was able to re-compose myself in order to continuing taking care of patients the next day, I will never forget this patient, and his memory will always be with me. Fortunately, despite having several patients pass away, we are able to help the vast majority of patients. We had a number of patients come into casualty this week that made dramatic recoveries as well. One such patient, was a 20 year old college student. She presented with acute lower right abdominal pain that had just occurred 2 hours prior to arrival. She was previously healthy. On arrival, she had a very low blood pressure, and severe lower abdominal pain. We gave her several liters of fluid while awaiting her lab work to return, but her pressures continued to be low. She denied the possibility that she could be pregnant, but we checked a pregnancy test anyways given her age and presentation. While waiting for the results, she was found to be very anemic with a hemoglobin of 5.7 (very low). We ordered emergency blood products to transfuse her, as she was becoming drowsy, and more hypotensive. We continued infusing fluids rapidly, and eventually her pregnancy test returned positive. Immediately, based on that result, I suspected a ruptured ectopic pregnancy, which occurs if the fertilized egg implants in the tubes instead of the uterus, and then ruptures. A quick ultrasound confirmed that there was no embryo in the uterus but a large amount of fluid (likely blood) in the pelvis. We rushed her to the OR where the OB team operated and confirmed the ruptured ectopic. She also had >2L of blood in her pelvis, which is why she was so hypotensive. She is now doing great after getting transfused, and the proper operation. Praise God that she presented when she did, and that we could help! There are numerous cases such as these of patients who present likely hours from dying, but after stabilization, a careful physical exam, and focused diagnostic workup, we are able to help many patients. We also have continued to have patients give their lives to Christ while in the casualty bay. Yesterday morning, casualty was slower than usual with only a few patients in the unit. Moses, one of the young Clinical Officer’s (equivalent to a PA in the U.S.) who was with me in casualty was very excited about the hour or so with casualty not being busy. Instead of just sitting around, he excitingly proclaimed to me, “Scott, this is a great chance for us to really talk to our patients about the love of Jesus.” We walked around spending extra time with every patient and there family about God’s love, the gospel, answering spiritual questions, and praying for patients. It was awesome to see Moses’ excitement to do this, as if he could not contain the love of God within himself, but just had to share it! A few days ago was an especially interesting day in casualty. First off, we were crazy busy. Our casualty unit has 7 beds, however, that day we had at one time 15 patients in casualty, most sitting in chairs or where-ever they could find room to sit. By 6:15 pm, we still had 12 patients in Casualty, most of them had been admitted, but were waiting to be taken to the various wards. However, since we were so busy, our two casualty nurses did not have time to wheel the patients to the wards. At 6:20, we received a phone call that there had been a serious, multi-car accident, and that 8 patients were being taken by ambulance to Tenwek, and would be arriving in 20 minutes! Over the next twenty minutes, myself and Steve, took matters into our hands and were wheeling patients all over the hospital trying to clear out the unit for the victims of the car accident. We quickly wheeled patients to the ICU, medical wards, surgical wards, pediatric wards, and for the ones not yet admitted, we moved them into the hallway to wait. Before we knew it, we had completely emptied casualty. This left a few minutes to inform the on call surgery residents, and additional clinical officers, and any other personnel that was around. We set up eight stations with IV lines, oxygen tubing, IV fluids, and other essentials. Next came the victims. Initially, the first two patients walked in and aside for some scrapes and bruises, looked not too bad. It seemed that maybe this wouldn’t be so bad after all. However, a minute later 6 patients were brought in, all bleeding, hurting, or even unconscious. Each consultant and resident assigned themselves to a particular patient. Since we didn’t know their names, patient were assigned a number based on the severity of their injuries with #1 being the sickest. The patient I was working on was patient #2. My patient had a massive laceration of his head with a large hematoma. He also dislocated his right hip and had a severe fracture of his left arm. Fortunately he was conscious. 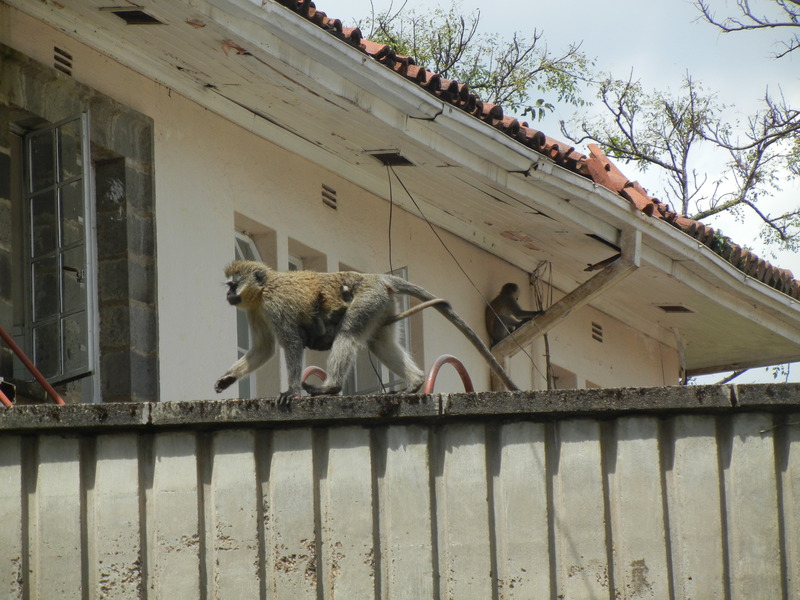 After getting him stabilized and determining the extent of the injuries, he was taken to the OR where he was fixed up. Patient #1 ended up dying, although everyone else has now been discharged from the hospital. It was a unique experience for me, since I have little experience working in an ER, and during those previous experiences, never had a mass casualty like this. It was cool to see the efficiency and teamwork displayed during that chaotic, but effective two hour period. Once again, I could go on and on with countless stories about the interesting cases we encounter on a daily basis, but again I have become more long-winded than I intended. I am on call this weekend, our last weekend at Tenwek. I cannot believe our time here is coming to an end. It has gone so fast, and been life changing! Please pray that our last week here will be fruitful and cherished, as we say goodbye to friends, patients, staff, etc. I hope to post once more before leaving. Anyways, I thought I would end with a few xray and CT scan images from some of the cases I have seen that may be of interest. Thanks for reading. 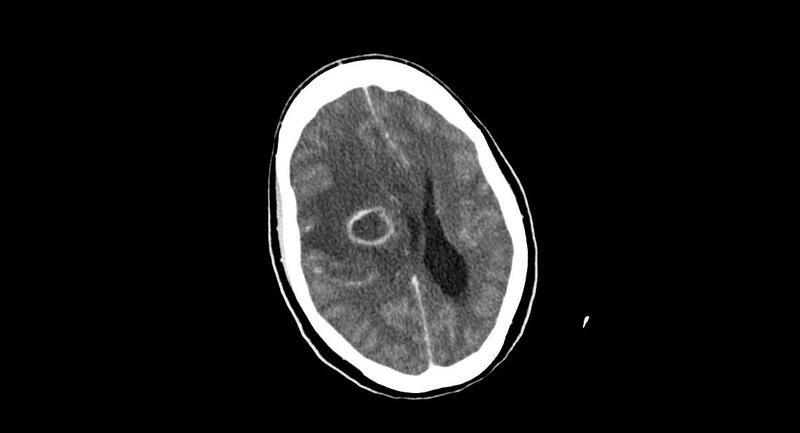 This is a young woman that had a large brain abscess (the white ring you see) with severe edema. She came in with multiple seizures, and could not move the left side of her body. We were fortunate to have a visiting neurosurgeon to drain the abscess, and she was recently discharged with continued antibiotics. Pray for her recovery! This woman presented to Casualty a few days ago after falling off a motorcycle taxi and smashing her head. At the top of the image, there is a large, depressed skull fracture. 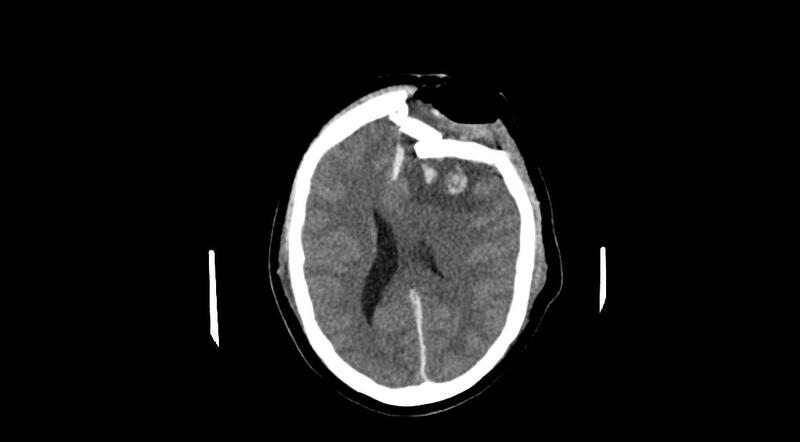 The fracture caused intracerebral bleeding and edema. Additionally, some of her brain was visible outside the skull. She received emergency surgery, and left the ICU yesterday. She is doing amazingly well with only mild neurologic deficits. This was the mass casualty patient that I saw (trauma patient #2 as discussed above). 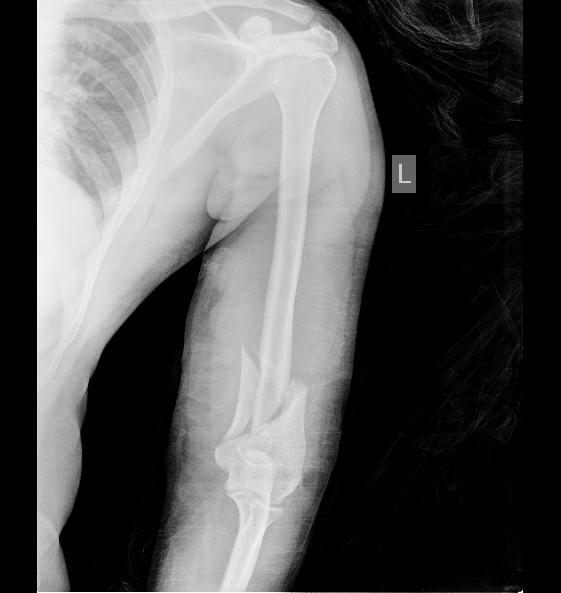 Here you can see his humerous (left arm) is fractured in multiple pieces. This patient was admitted for “asthma”. However, when I met him, I heard what sounded like stridor (a high whistling breathing noise caused by airway obstruction). On examination, he had a massively enlarged thyroid gland that can be seen extending into the chest above. 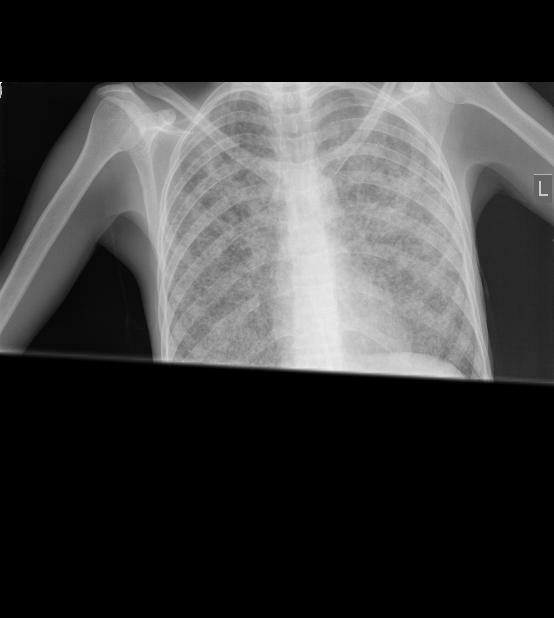 CXR showed his trachea was displaced and extremely narrowed with as little as 1-2 mm left for air to pass through. He was likely only hours from completely obstructing his airway which would cause him to suffocate. Fortunately, we had his thyroid removed, and he did great! This xray is extremely abnormal. This is an unfortunate woman who came in with severe anemia. She received a unit of blood from a relative on arrival, and within hours of her transfusion, she developed severe respiratory distress, requiring intubation. Her xray revealed that she likely had TRALI (transfusion related acute lung injury) which is a rare reaction to a blood transfusion. Unfortunately, despite our best efforts, she later developed kidney failure and passed away. 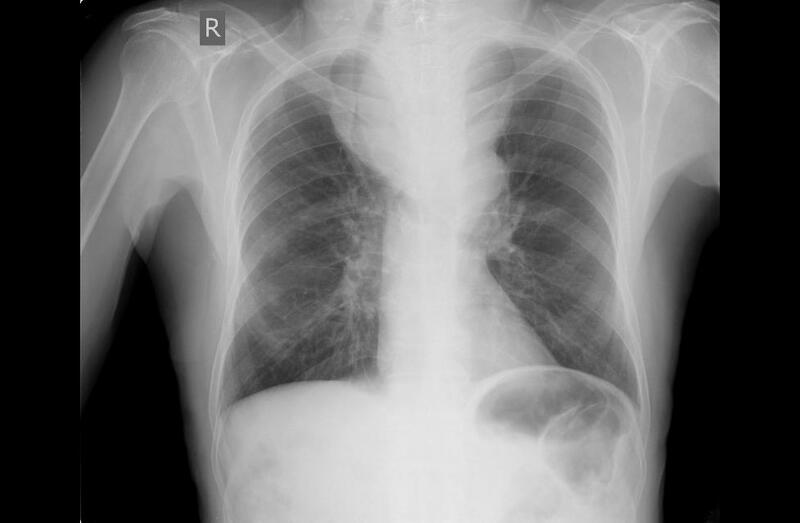 This is what disseminated, or miliary TB looks like on CXR. We see this often, and patients tend to do poorly with this, especially if they also have HIV. This woman recovered well and has been discharged home. -On Saturday, we had a women present with a severe nose bleed. She had severe thrombocytopenia (low platelets) which prevented the bleeding from stopping. In the U.S., we could give a transfusion of platelets, but we do not have platelets here. Instead, in order to give platelets, a relative has to donate blood to be given. No relative was available with matching blood type. We proceeded to pack her nose with gauze, and held pressure, but she continued to bleed into her mouth, suggesting the bleed was coming from the posterior (back part) of the nose. In the States, we would use a “Rhino Rocket” (device that goes into the nose) or have the vessels cauterized by an ENT specialist. Unfortunately, she was losing blood fast and was developing hypovolemic shock (very low blood pressure) from the blood loss. On a whim, I grabbed a new Foley catheter (the type that goes into the bladder and is used to drain urine). I placed the catheter through her nose and into the back of her throat. Following that I was able to blow up the balloon of the Foley in the back of her throat, pull the Foley back out her nose, and the balloon caught against the back of the nose, compressing the bleeding spot. The bleeding stopped with this contraption long enough for us to be able to tranfuse her! There have been several other situations in which I have been stretched medically, and have done things I have not previously done such as bone marrow biopsies, administering chemotherapy (typically done by oncologists…we don’t have them here), and I even did a pericardiocentesis. This procedure is typically done by trained cardiologist under imaging guidance, but again, no cardiologists here. We had a woman with a large buildup of fluid in the sac around the heart (likely from TB) causing pericardial tamponade, which means the fluid is making it difficult for the heart to beat. We attempted to treat the TB with hopes she would improve, but she worsened, and actually coded. I had read how to do the procedure just that day, and actually performed the procedure following the code. I inserted a syringe under the ribs, pointed toward the heart, advanced (praying I would not hit the lungs, blood vessels, or heart itself. Eventually, I reached the pericardial sac, and we were able to drain a few hundred milliliters of fluid and she initially improved, but unfortunately died two days later. She was only 35, and she joined several other very young patients that have passed away. Amazingly, a few patients have gone against this trend, as we have had a 100 year old, 115 year old, and believe it or not, a 120 year old patient on service. It is crazy to think that the 120 year old patient was born in 1892, which likely makes her one of the oldest, if not the oldest living person in the world right now! She is still going too, after being discharged this weekend! The daily death here can be difficult, but it offers a chance for amazing spiritual conversations and prayers with the patients and their family. The majority of patients are Christians, but many patients are not believers. In fact, just today, we had a 24 yo patient, with advanced cancer, give his life to Christ. He did not grow up Christian, but has been coming to Tenwek for the last few months for his care. He said that he noticed something different about the nurses, doctors, students, janitors, administration here, and he wanted to know what it was. He told us today, that he has discovered that what this “difference” was, was the love and peace of Jesus Christ. Today during our conversation, he told us that he wanted to give his life fully to Christ. We prayed with him, and he accepted Jesus as his savior! Praise God! It is amazing how as Christians, whether a doctor, nurse, teacher, custodian, administrator, business person, or anything else, our attitudes, conversations, and love can reflect Christ to the world. There is so much more I want to share, but I once again have become quite long winded. Next post, I will share about a truly miraculous story of healing that I witnessed over the weekend, but I will save that for another time! Anyways, thanks for reading if you made it this far. Below, I just wanted to share a few pics from a hike that Whitney and I did last week with a few other visiting missionaries. 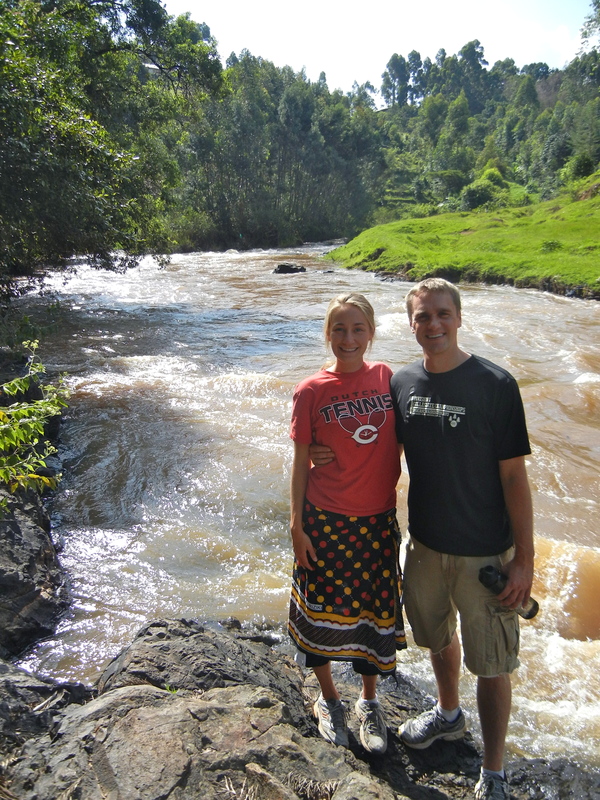 Whitney and I after reaching the river near Tenwek. 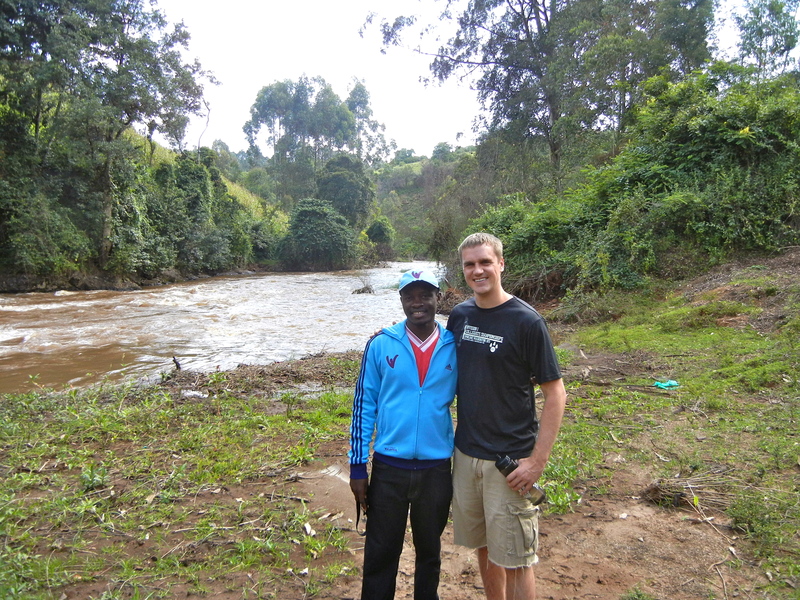 Here I am at a different part of the river with William, a visiting medical student from Ghana. On our way back from the hike, we somehow ended up in a cow pasture, we needed to reach the gate in the background of the picture, however, there were several cows, and most notably one very large bull blocking the way. We opted to turn around and find a different way back, rather than mess with that bull! 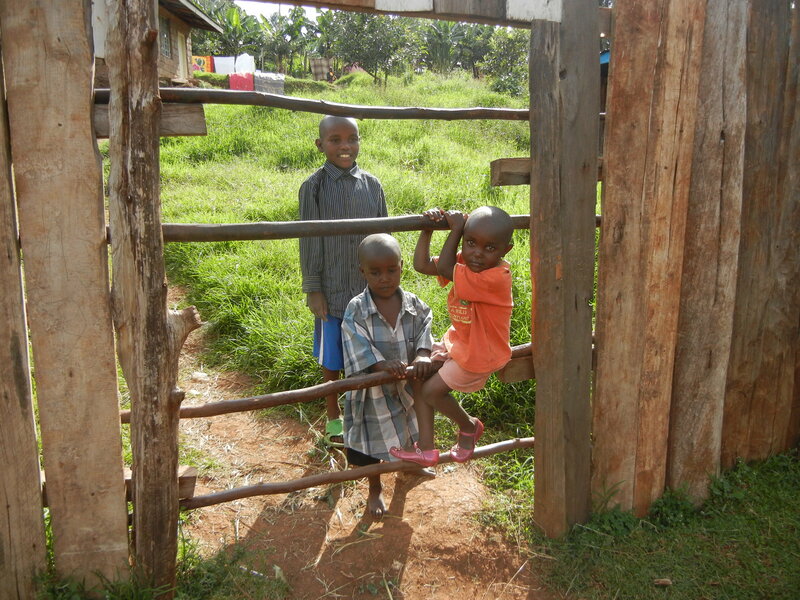 We ran in to theses three adorable kids on our way back. 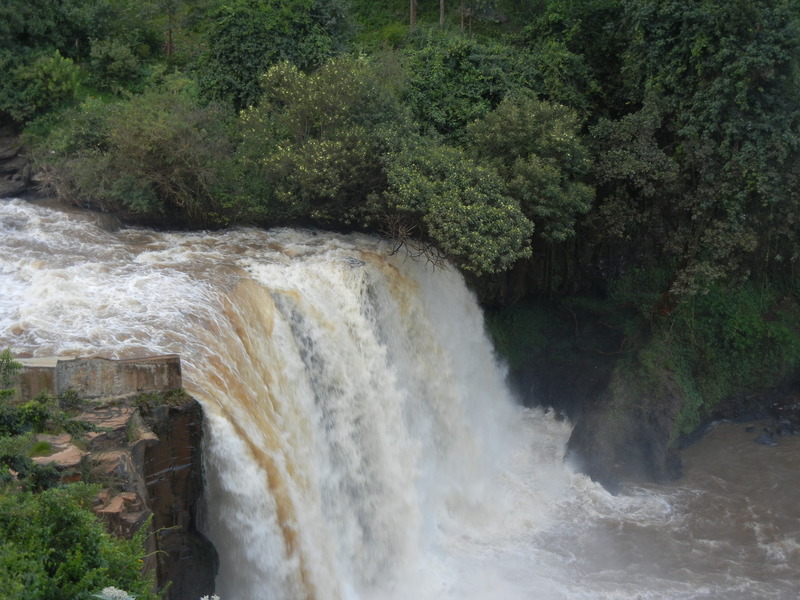 Waterfall just below the Tenwek hydroelectric dam. First, thanks to all of you who have been praying for Romano. We have good news to report! He is recovering well, and Scott said he actually was transferred out of the ICU today, which is a step toward leaving the hospital. Praise God! Life moves so quickly! It is hard to blog about everything and do it all justice. Below is my brief attempt to fill you in on a few of our recent happenings! 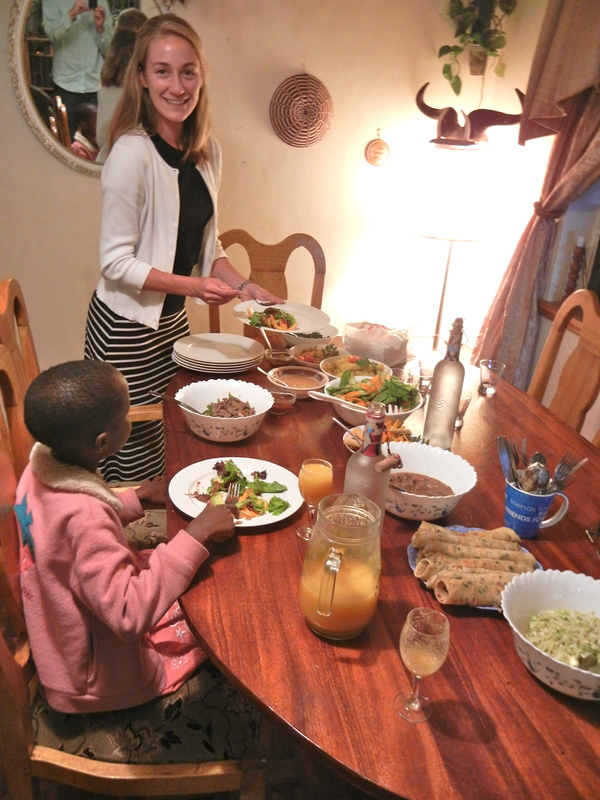 Last Friday evening we were invited to Pete and Lisa Kuyaya’s house for a Kenyan dinner (they are Kenya natives). They are two of the nicest people I think I’ve ever met! On Wednesday of last week Scott and I were attempting to squeeze a quick walk in before it got dark at 7:00PM. 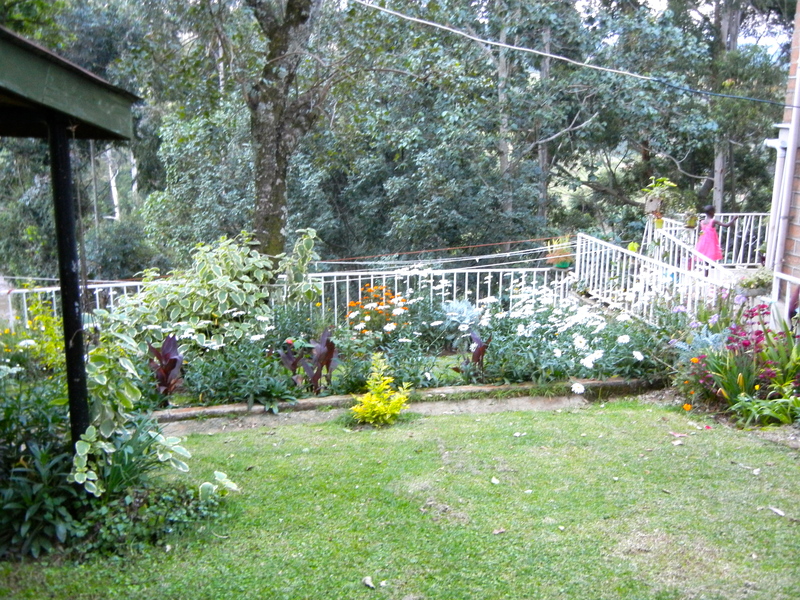 On our way, we were admiring a home with beautiful flowers growing all around it. As we stood there, Lisa, the Volunteer Staff Coordinator at Tenwek, came down the dirt road and greeted us and we realized that this was her home. 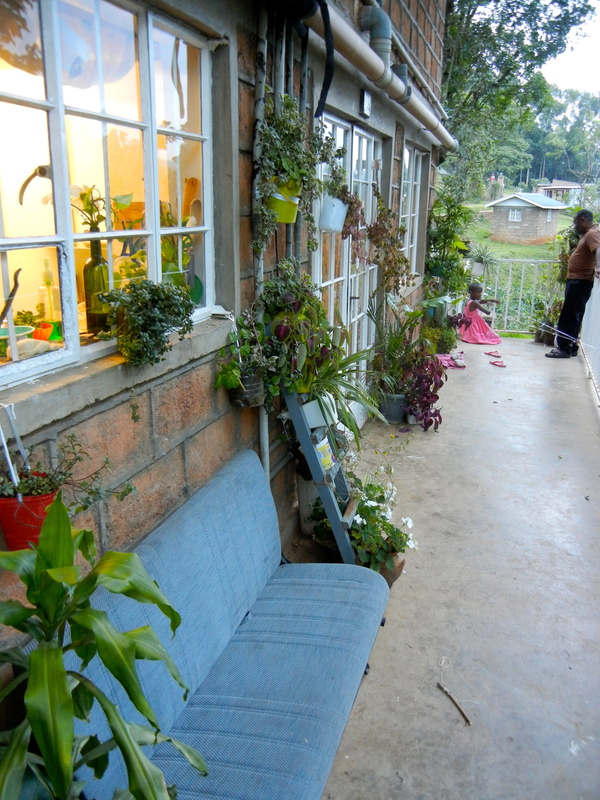 We complimented her on the flowers and she laughed and joked and said their were more plants inside the house. 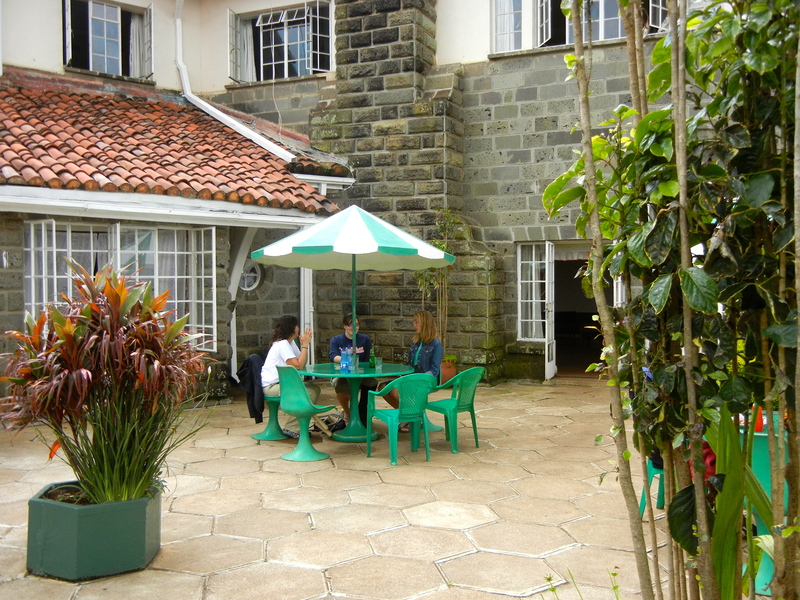 Or at least I thought she was joking until she invited us in for chai, Kenya’s national drink. (Ok, I made the “national drink” part up, but it should be as it is impossible to go a day without chai!) We accepted the invitation and we soon saw that she was not joking about having more plants inside. Pots and vines were everywhere. Vines were trained up the ceiling and over and across to the other side of the room. One could make a game of finding which pot a vine originated from! Pete and Maria playing on the deck. 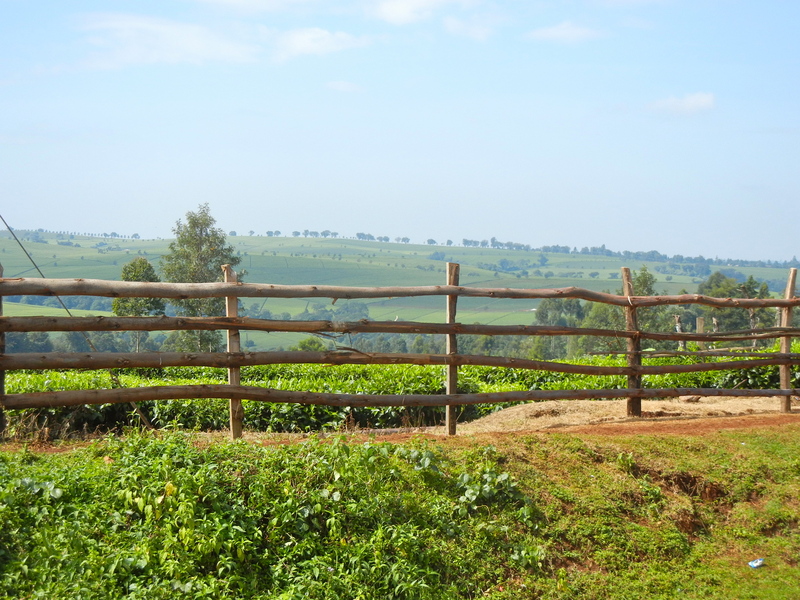 Once seated, Lisa’s daughter, Maria, who is in third grade, prayed for our chai (so sweet!) and then Lisa served us the best chai we have had thanks to her fresh cow’s milk (unlike the usual unrefrigerated, ultra-pasturized milk that is common here that I think it tastes awfully funky) and a Tea Masala blend of spices which made the tea taste more like Indian chai. Soon enough, Pete, Lisa’s husband who is a dentist at Tenwek, was describing the wonderful food Lisa makes and how she is a great cook. Well, of course I had to find out all about what she makes and how she makes it. In the end, Pete suggested a Friday night duo supper where the two “expert cooks” would make the food (Lisa the Kenyan meal and I a dessert) and the two “expert eaters” (Pete and Scott) would do their share of eating. It is thus how Scott and I were invited to our first Kenyan meal in a Kenyan home and we looked forward to Friday night with great anticipation. The meal on Friday did not disappoint! Lisa made so many dishes it was like a grand buffet! There was beef stew, beef stir fry, chapatis (like tortillas) with carrot and cilantro shreds inside the dough, sukuma wiki (cooked kale), cooked cabbage with cilantro, sauteed green beans and julienned carrots, a tomato and pickled ginger chutney, a tomato chutney with sultannas, Mukenye (mashed sweet potato and beans), Matoke(boiled and mashed green bananas) served with a peanut sauce, a lettuce salad with carrots and avocado, and homemade mango-pineapple juice. 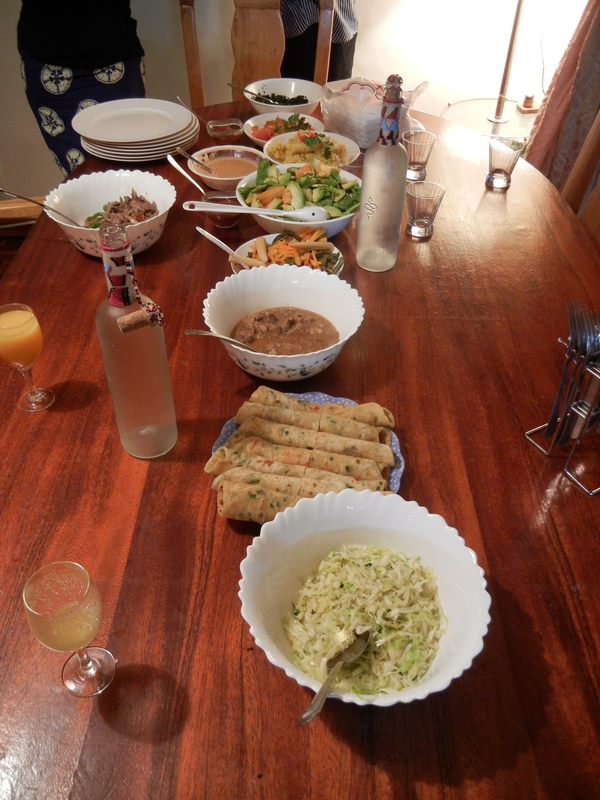 Starting from the bottom to the top: cabbage with cilantro, chapatis, beef stew, sauteed carrots and green beans, beef stir fry, avocado-carrot lettuce salad, a tomato chutney (hiding behind the spoon handle), peanut sauce, matoke, mukenye, another tomato chutney, and sukuma wiki. It was all so good and fresh with almost all of the vegetable dishes coming straight from her garden–and if not her garden, then a farm a few miles away. Except for the chutneys, none of the foods had any additional spices or seasoning. I have been told by another Kenyan that lack of seasoning, besides salt, is common because historically spices have been expensive and thus they were never incorporated into the Kenyan cuisine (except on the coast of Kenya due to trade and the proximity to India). For dessert, I made this fudgy chocolate cake set in a pool of orange curd from this recipe with a variation of these espresso meringues crushed over top of the cake for texture. I used my precious Ghiradelli chocolate chips I brought from the States (which I think my mom bought me for Christmas!) for the cake and I had to borrow beaters and an oven (my oven ran out of gas–terrible timing) to make the meringue cookies. In the end though it was all worth it and I’m so glad I went the extra mile because Lisa’s meal, and endless leftovers, were such a blessing to us! 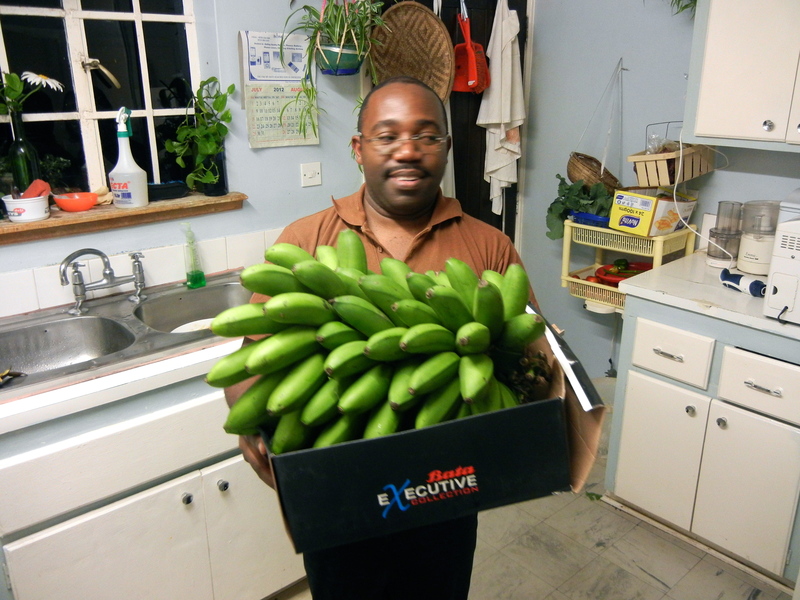 Daktari (Doctor) Pete proudly shows us the green bananas used to make the matoke. 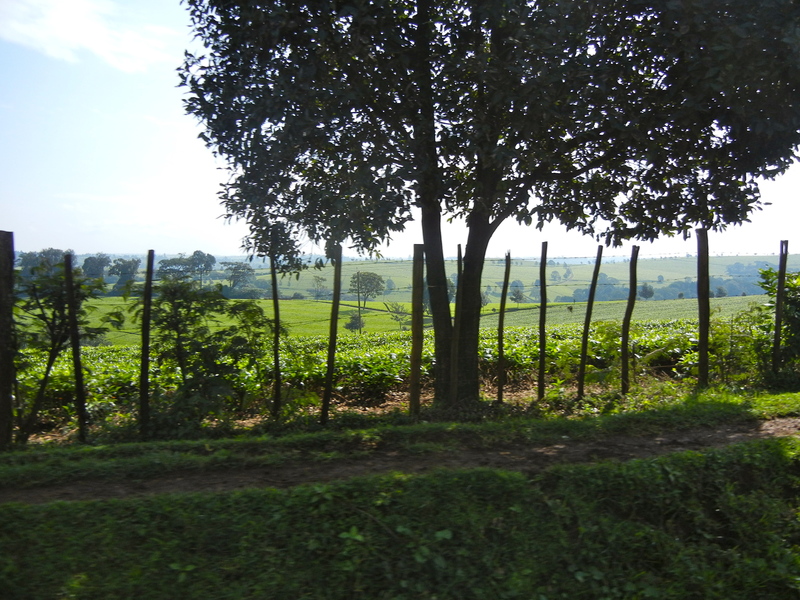 The next day, on Saturday, Scott and I went with a group of other visiting medical staff to a town called Kericho (1-2 hours away) for a day trip. 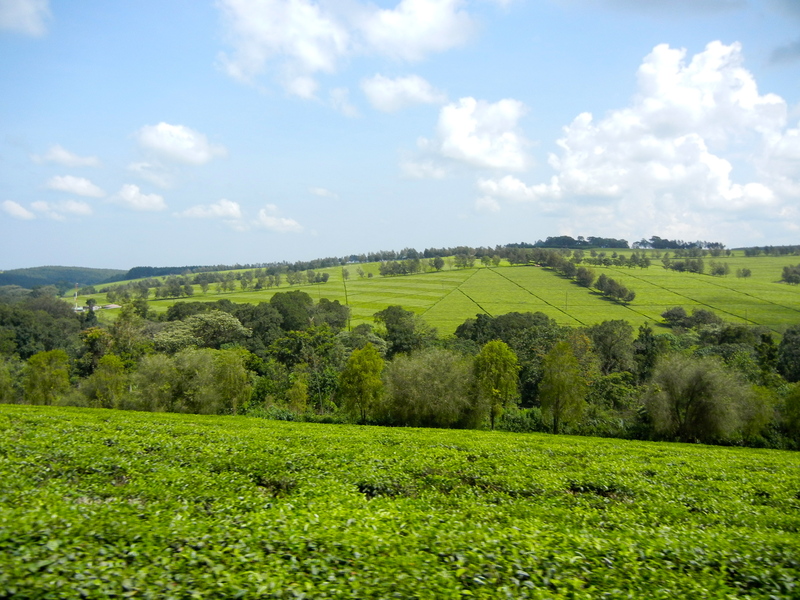 On the way we passed by beautiful countryside, followed by gorgeous tea plantation fields, and then ended at the Tea Hotel in Kericho for lunch. 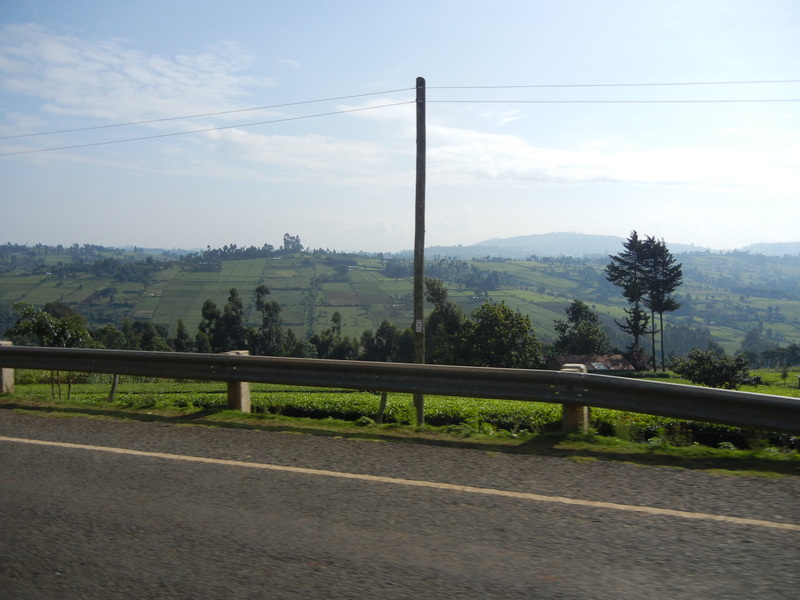 Below is a bunch of pictures (most taken while driving) so you can hopefully get a good idea how pretty the countryside is here and learn a few cultural tidbits. Enjoy! 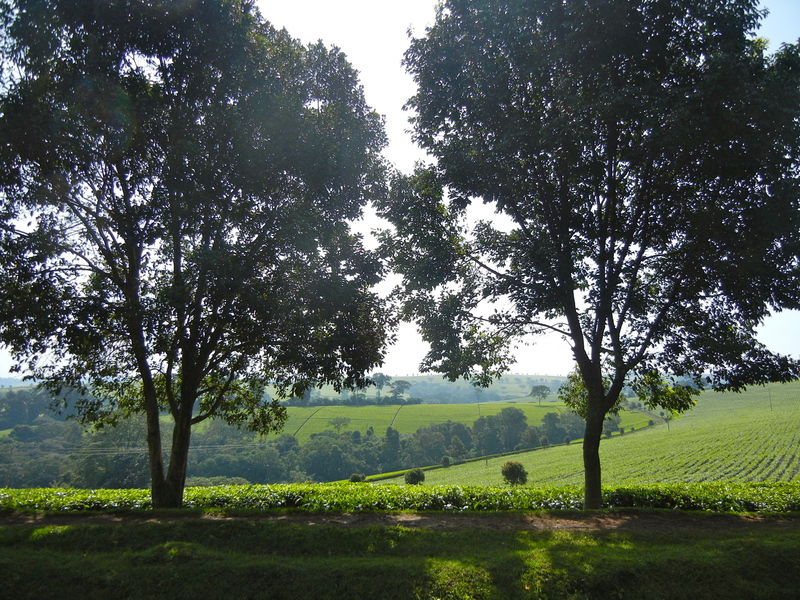 The countryside surrounding Tenwek. Sorry for the large proportion of road in this picture! Scott took this picture out of the car’s back right window and you drive on the left side of the road here! 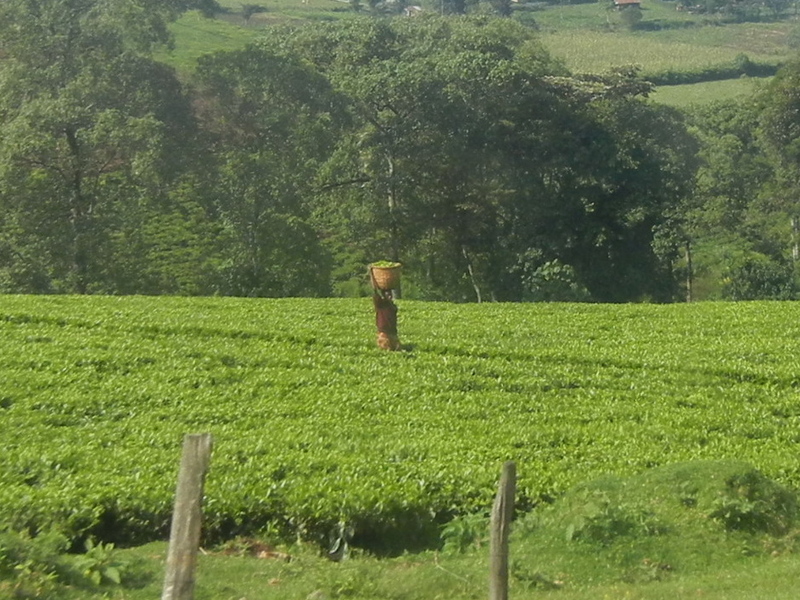 A tea picker with a full basket of tea leaves on his/her head.
. . . and this one too. 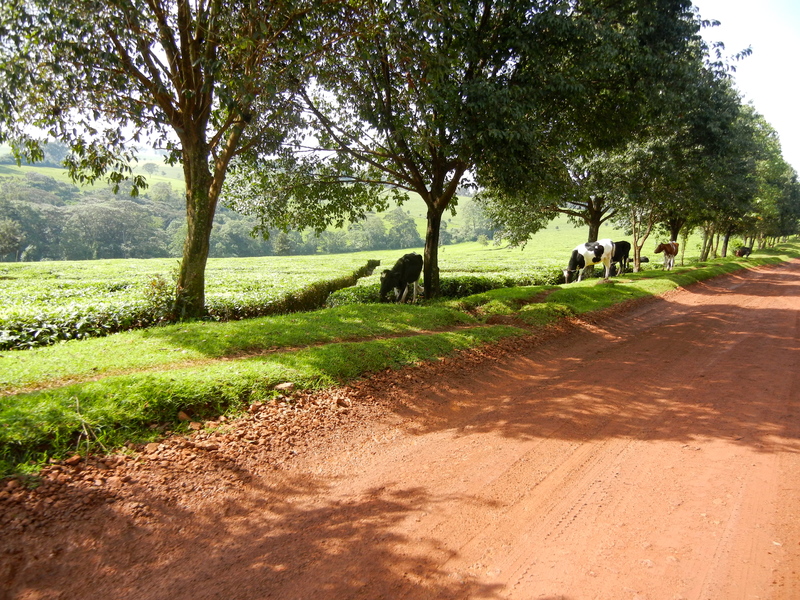 Some cows on the side of the road. Cows are everywhere here, they’re as plentiful as the squirrels are in North Carolina, only they are bigger and sometimes accompanied by a mean and dangerous looking bull so it is best to be careful. 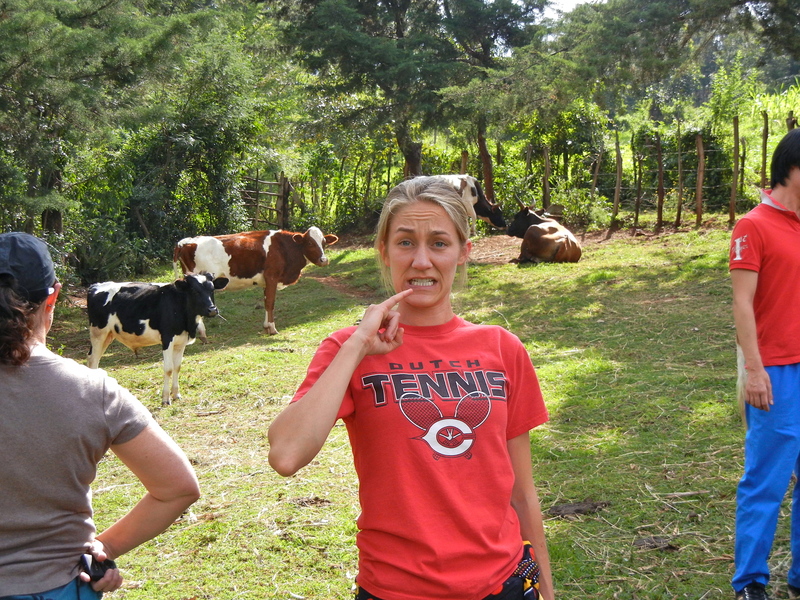 That said, I wonder if Kenyans ever tip cows over while they sleep like Iowans . . . thoughts? I think I may have to do some investigating. 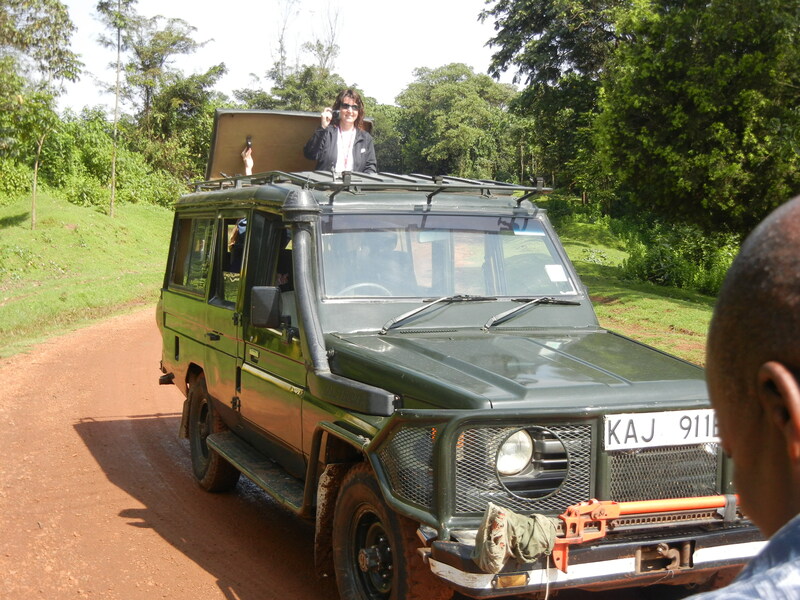 Ok, so I know the dirt road here and in the picture above look relatively smooth, but trust me, we NEEDED this vehicle. Don’t leave home without one! 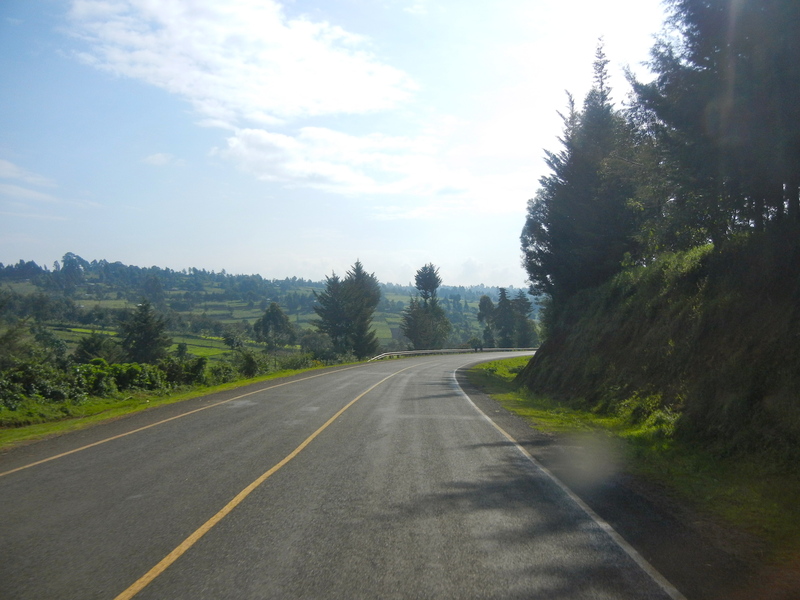 The roads are so rough, riveted, rocky, rrrr-something and full of potholes, that you are constantly tossed and jostled around. These cars are also useful for when it rains and the roads turn to mud. 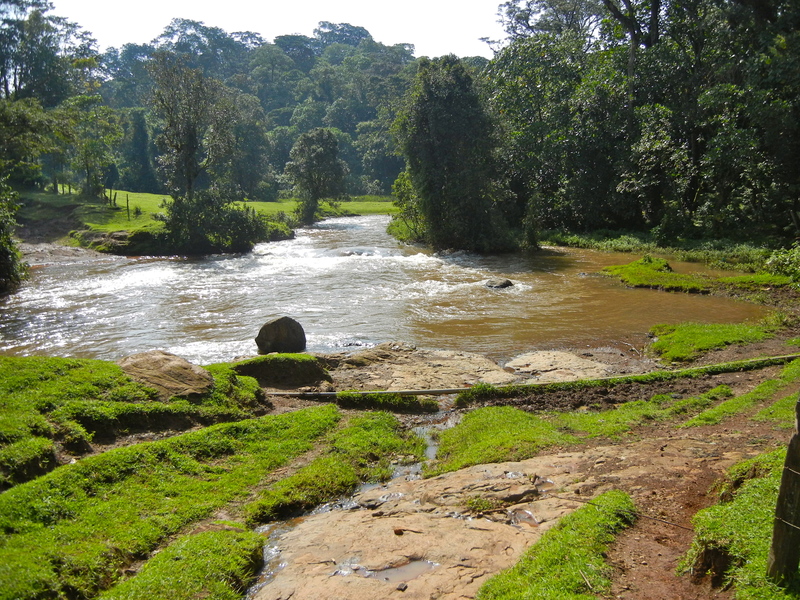 Our driver, Donald, stopped just before we drove through this river saying, “Just one minute,” as he got out of the car and disappeared into the trees on the side of the road (AKA-nature called). Scott and Allen (a prosthetician) looked at each other and decided to do likewise. Unfortunately, there are no reststops or bathrooms for girls to use! 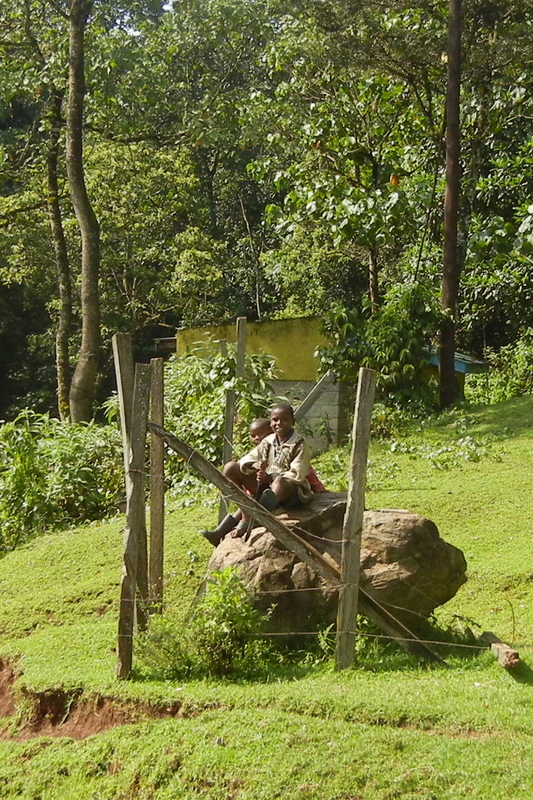 Luckily, there were these two little boys on the side of the road with a panga (a machete-like sword) who could, um, protect us? The beautiful scenery continues . . . 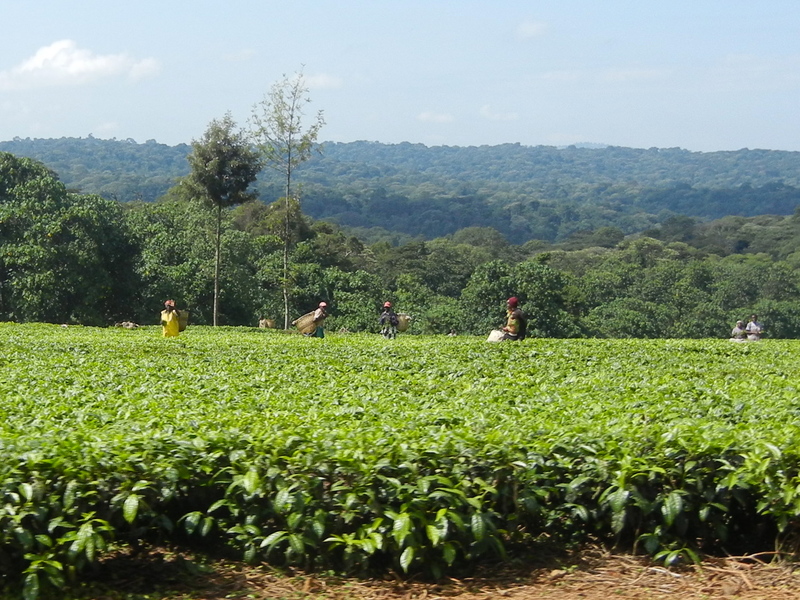 Tea plantation workers with baskets on their backs on a British tea plantation. 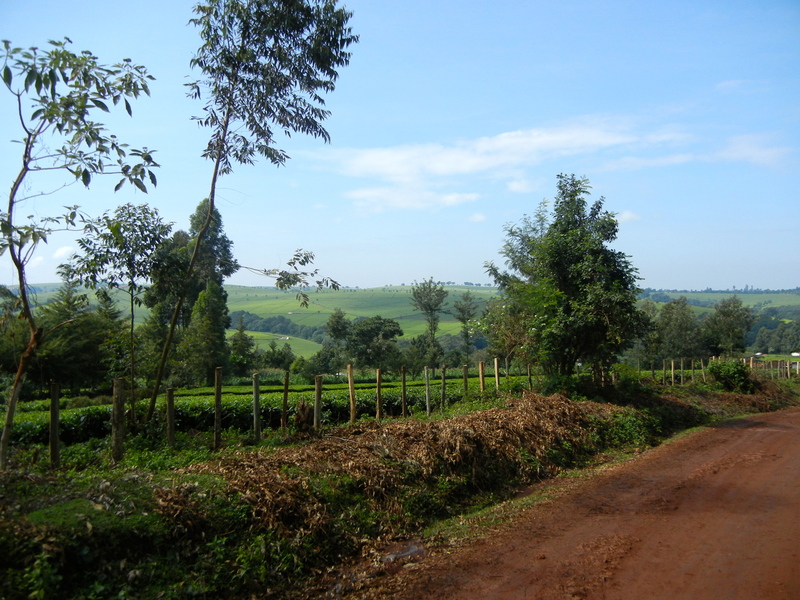 As we drove by many people, like the guy on the left in yellow, eagerly waved to us as we drove by, often with fists full of tea leaves. In fact, so many people eagerly waved to us on the back-country, dirt road that we took, that it felt a bit like we could have been on a float in a small-town parade throwing candy to the kids or something. Perhaps people along the rough road we took don’t see many muzungus (white people) forging their way through, or perhaps Kenyans are just that friendly. 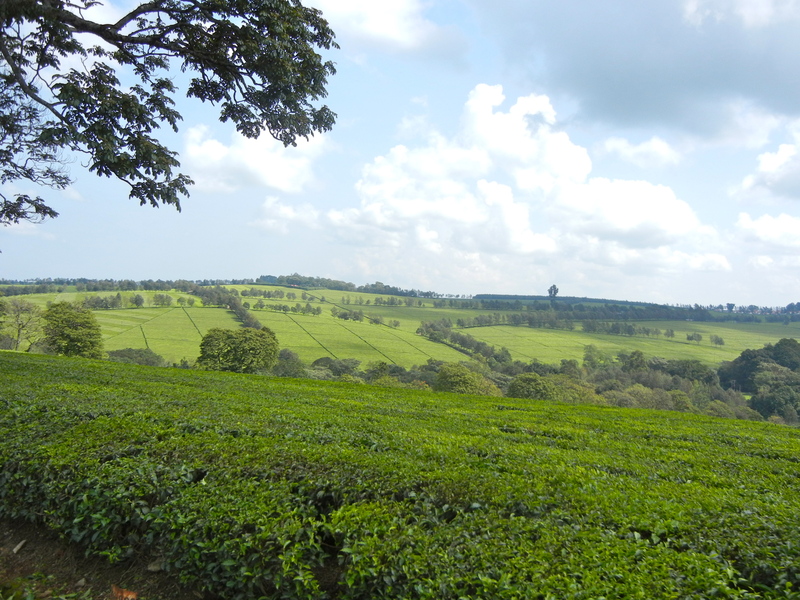 Ok, do you see the uniformity of the trees in the distance here? 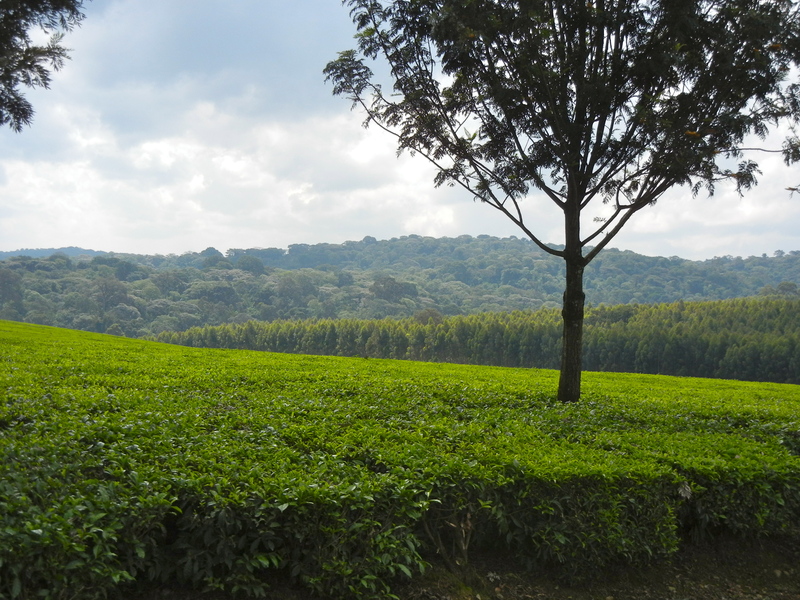 These trees are also planted and harvested by the tea plantations and are used in the making the tea. The trees they use grow this tall in only five years and every time they harvest a “field” they plant new trees. Once harvested, they cut the tall skinny trunk up into four foot pieces and uniformly stack them high like a Jenga game until they are burned and used to dry out the tea leaves. 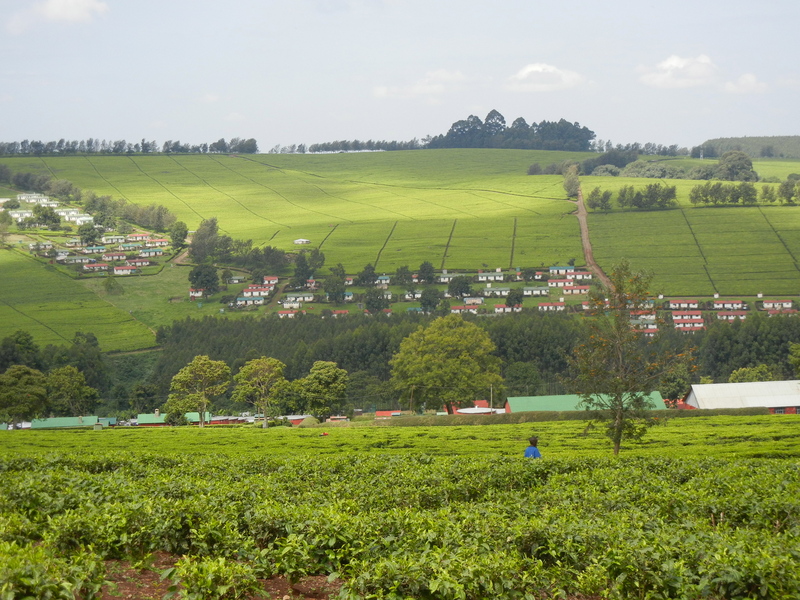 Identical houses of the plantation workers, some are rectangular like these, other groupings are circular like the traditional Kipsigis hut. 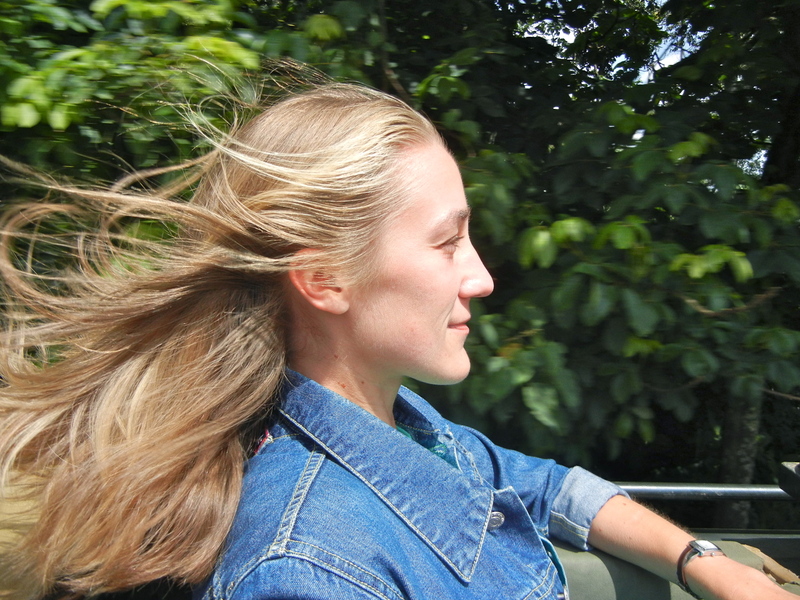 Here we were on smooth road going at a reasonable pace and I felt divine with the sun on my face, the wind tossing my hair, beauty all around, and no worries. Life was good, and then Scott snapped this pic of me. I think I look like Crazy Horse, what do you think? 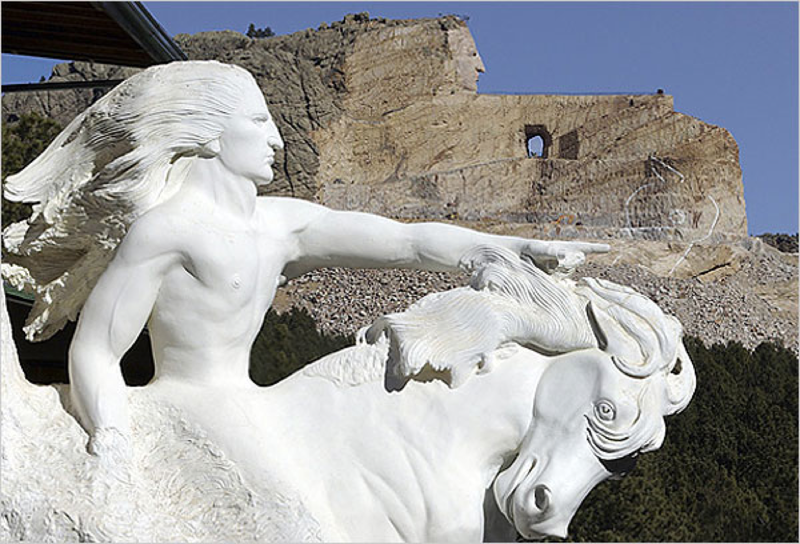 The Crazy Horse Memorial in the Black Hills of South Dakota. 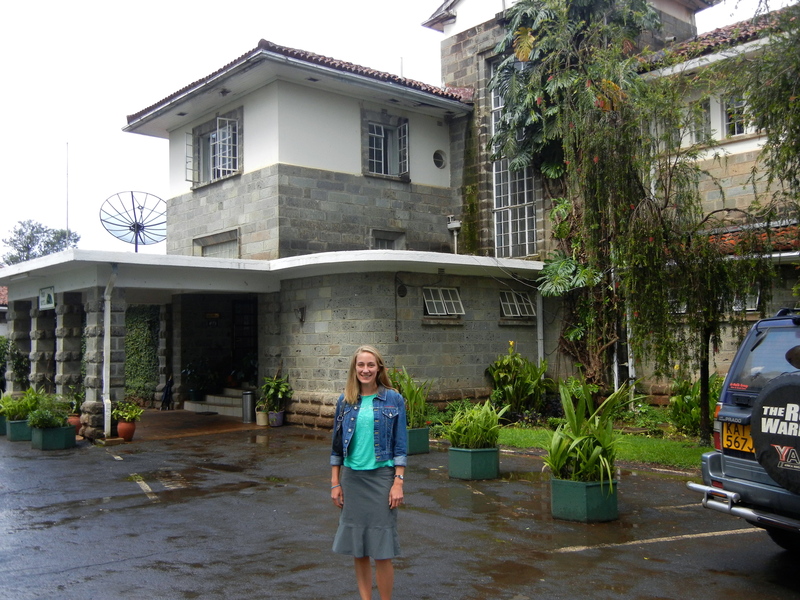 Me outside of the Tea Hotel in Kericho where we had lunch. The girls at the table. 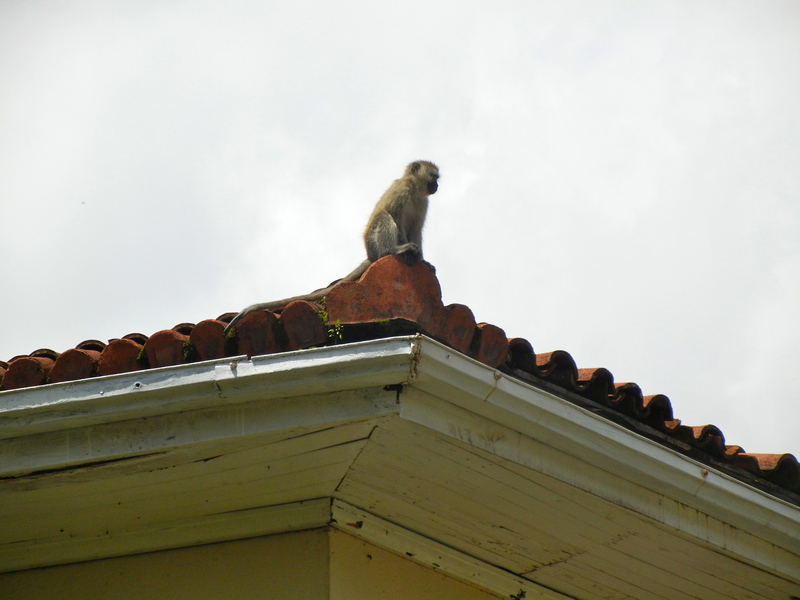 Monkeys played on the rooftops while we ate. 8:30 -9:30: Morning report. Typically someone will give a presentation on a variety of medical issues. 9:30-10:30: Interns round on the rest of the patients. We help manage the most acutely ill.
10:30-11:00: CHAI TIME! This is a fun tradition here. At 10:30 am every day, the hospital essentially stops and everyone breaks for chai which provides a nice break from the busy schedule. The internal medicine team meets in a small room with the attendings, interns and med. students. One of the interns typically opens in prayer and then we discuss any deaths from the previous day, as well as any important issues. 11:00-1:30: We round on all of the patients on the male and female medical wards, usually 40-45 patients. Sometimes the wards are extra crowded requiring patients to share beds or even sleep on the floor. 2:30-end of the day: There are a variety of things going on in the afternoon. I help the interns with procedures or issues, intermittently check on our ICU patients to adjust meds, ventilator settings etc., see patients in clinic or in Casualty (the ER here is called casualty). 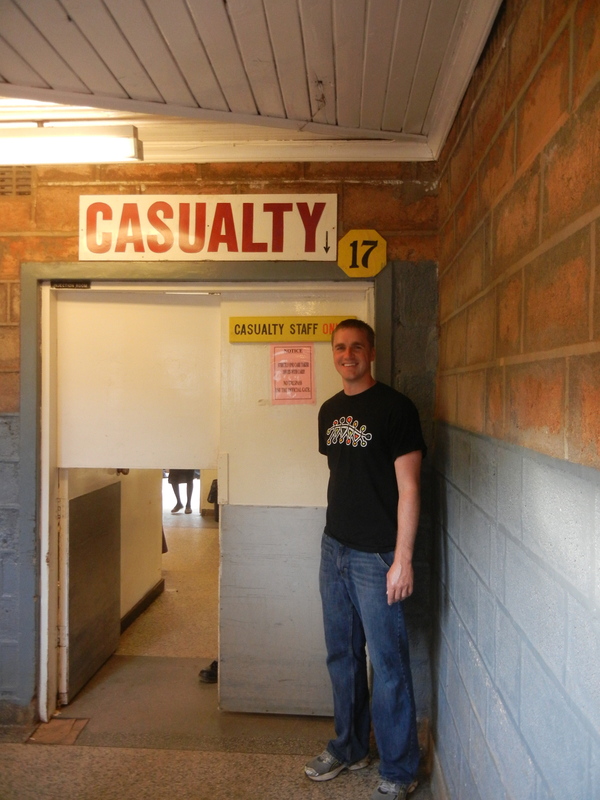 Standing in front of the Casualty (ER) entrance. If not on call, the day typically ends around 5:30-6:30, however, call nights are different. 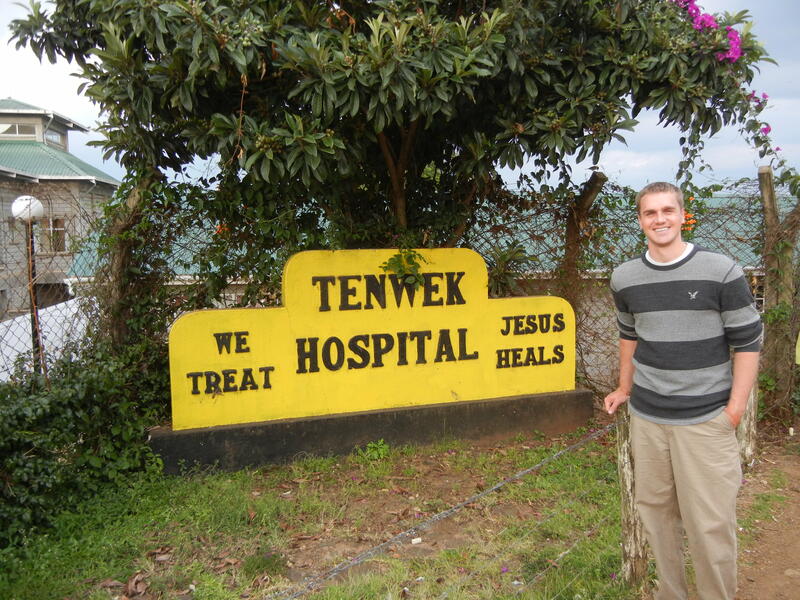 At Tenwek, I am considered a consultant, which is the equivalent to an attending physician in the U.S. Basically, that means I have a team of Kenyan interns and medical students who are admitting patients, placing orders, managing issues, and presenting the patients to myself and the other consultants. 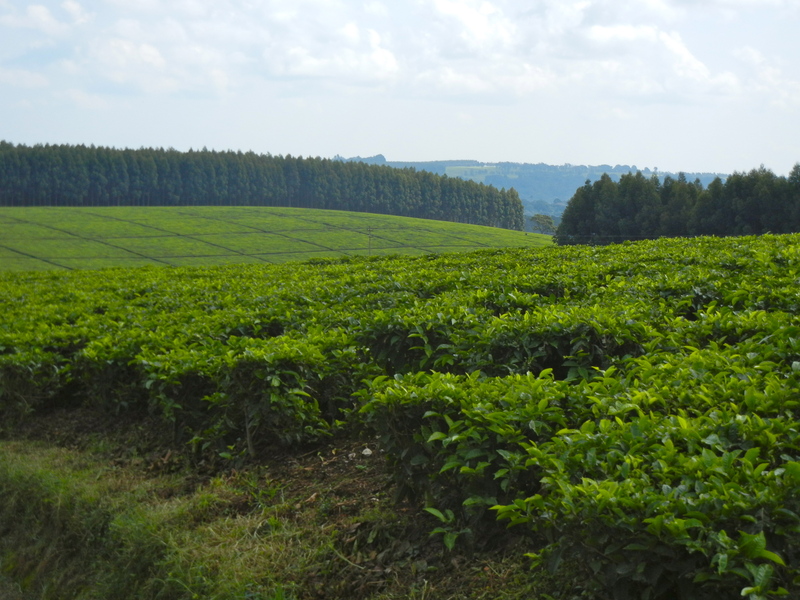 Currently, we have three other consultants including two long term staff, and a visiting physician from Canada, however, our numbers will dwindle to two including myself within a few weeks, which will greatly increase the work load. My first day was a whirlwind, with a high number of acutely sick patients. 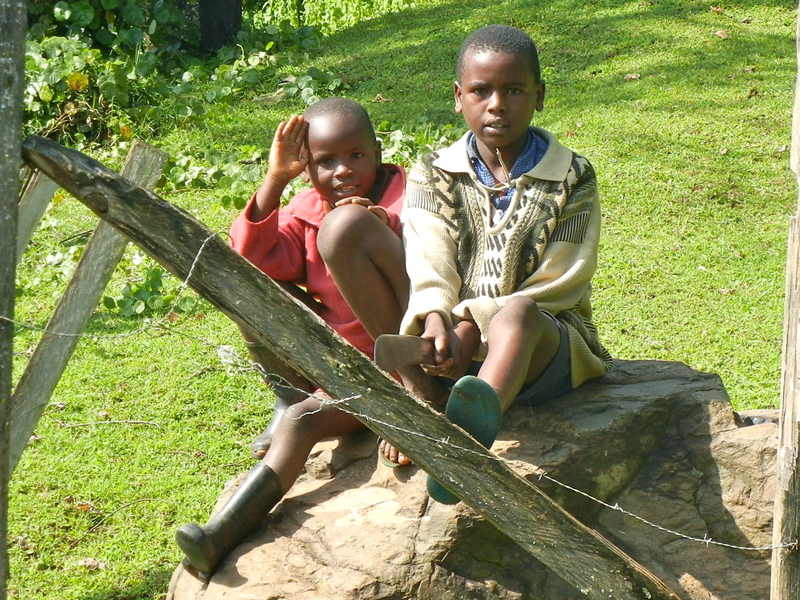 Although the cost of medical care here is very minimal (a hospital admission may cost only 20-30 dollars per day), this is still a significant chunk of their income, so they often present late in their illness as they try to avoid coming to the hospital. We see a large variety of diseases here, some are similar to the U.S., but the most common diseases here, are rare in America. Thus far, I have seen a large number of cases of tuberculosis, several people with meningitis, and an extremely high number of patients with AIDS/HIV (probably >50% of patients) and complications from this disease. We also have a high rate of esophageal cancer, rheumatic heart disease, and lymphoma among other various diseases. 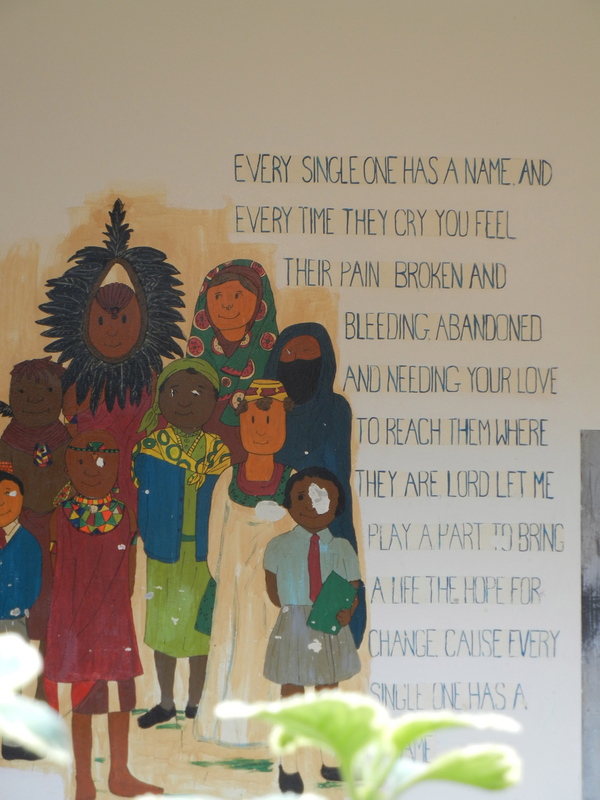 Mural painted just outside the entrance to the men’s and women’s medical wards. My first night, I was on call. It was quite busy until about midnight. I had several interesting admissions, most of which we were able to stabilize and they are all doing well. 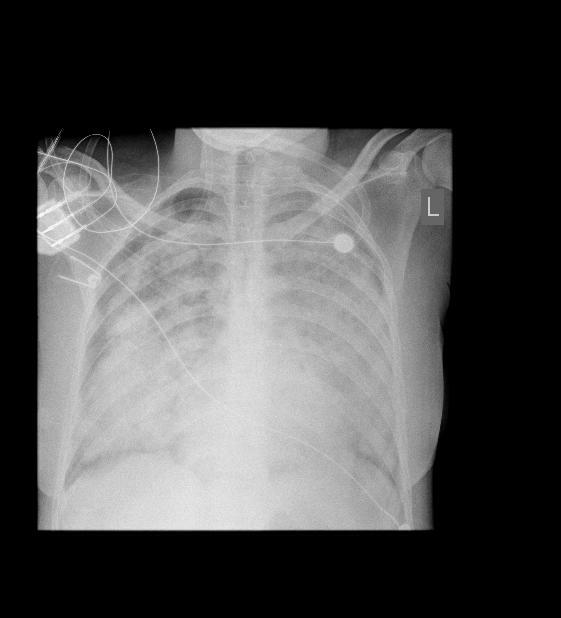 One patient had a large pleural effusion (fluid around the lung) which was causing significant respiratory distress. With pleural effusions, the initial treatment consists of performing a thoracentesis which is a procedure done to drain the fluid by inserting a needle/drain into the lung cavity to remove the fluid and allow the lung to properly function. In the U.S., we have a kit that allows for fast and relatively easy removal by aspirating 100 mL at a time. Here, however, the largest syringe we had available was only 10 mL. She had more than 1000 mL of fluid around her lungs, so I had to draw out 10 mL of fluid at a time, and do this 100 times in order to remove enough fluid! It took forever, but she was a good sport and was definitely feeling better afterwards. Most other admissions that night, we were able to stabilize and improve. Unfortunately, one of the patients that was admitted a few days prior, passed away. I was actually walking by the medical wards, and a nurse grabbed me to inform me a patient was not breathing. On arrival, he was not breathing and did not have a pulse. With his family there, we had to inform them that he had died. He was only 41, and likely died from complications of kidney failure, as there is no dialysis available here, and it is only available in a few cities in the country. After informing the family and offering my condolences, I was amazed at their peace about his death. This patient had been suffering for some time according to his family. He was an active believer in Christ, and although his mortal body failed him here, his family knows that where he is going is so much grander than here. He is going to be with the Lord, where there will be only joy and singing. I called the chaplain, and we prayed together in English as well as their native Kipsigis tongue as this man went to be with God. When I made it back to the guesthouse that night, I reflected on this patient. Although I wished we could have somehow healed him, I rejoice in the fact that he knew Christ and is now in Heaven. That night, I read Isaiah chapter 35 which really spoke to my heart about the reassurance we have in Christ, and the joy of the redeemed that awaits this patient, as well as all who believe. What an amazing visual picture of what awaits us!! and the ears of the deaf unstopped. and the mute tongue shout for joy. and streams in the desert. the thirsty ground bubbling springs. 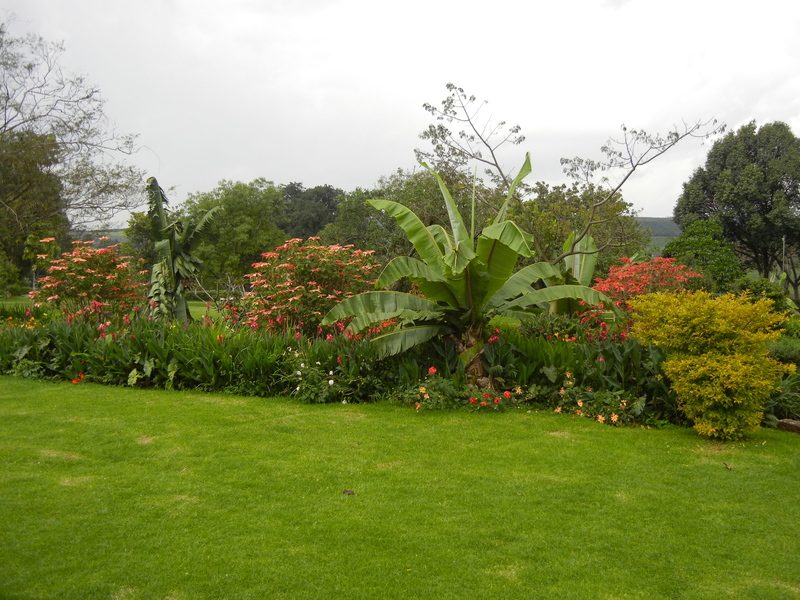 grass and reeds and papyrus will grow. they will not be found there. 10 and those the Lord has rescued will return. everlasting joy will crown their heads. Well, I think that is enough for today. Sorry about the length of this post, I will aim for a shorter entry next time! Whitney and I are off to a pig and goat roast now put on by the surgical residents. We were invited after Whitney proctored their end of the year exam yesterday…should be interesting. Don't miss a post! Subscribe here! Jotting down some thoughts. . .